The President, Directors and Company, of the Bank of the United States, commonly known as the First Bank of the United States, was a National Bank, chartered for a term of twenty years, by the United States Congress on February 25, 1791. Establishment of the Bank was included in a three-part expansion of federal fiscal and monetary power (along with a federal mint and excise taxes) championed by Alexander Hamilton, first Secretary of the Treasury. Hamilton believed a national bank was necessary to stabilize and improve the nation’s credit, and to improve handling of the financial business of the United States government under the newly enacted Constitution. 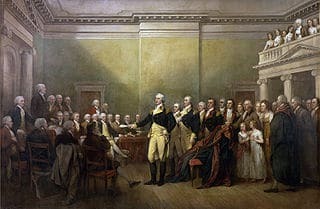 Officially proposed to the first session of the First Congress in 1790, Hamilton’s Bank faced widespread resistance from opponents of increased federal power. 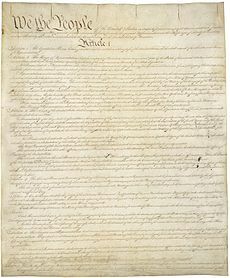 Secretary of State Thomas Jefferson and James Madison led the opposition, which claimed that the bank was unconstitutional, and that it benefited merchants and investors at the expense of the majority of the population. 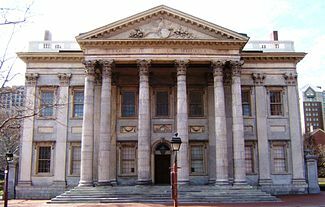 The First Bank building is now a National Historic Landmark located in Philadelphia, Pennsylvania within Independence National Historical Park.